What follows is but a small number of the best and the worst of Delaware. Some are political, some are simply members of our communities, some are guest here at Delaware Right. Some are serious, some are just silly, and others are seriously silly. Some are god natured fun, others are serious shout outs to people who work hard to make our small state the great place it is to live, work and raise a family. Some will embarrass people, some will anger people, some will make you laugh, some will make you say, “Oh no he didn’t”. This is a small list, our guest are invited to add to the list. We ask that you keep it fun, lite hearted and non-actionable. The award for bringing more transparency to politics and government, goes to Jim Weller and Collin Walls for their Catch It Live broadcast on the final day of the legislative session on June 30th, 2013. Taking the biggest risk award, goes to all of the legislators who were willing to be interviewed during that broadcast. The award for taking the job nobody wants, goes to Charlie Copeland for taking the position of State GOP Committee Chairman. The award for speaking in the third person the longest, goes to one of our frequent guest here at Delaware Right, Tuxamus Maximus. This award may have to be cut into several pieces, and shared, we are just not sure how many pieces yet. Rising Republican star, goes to State Senator Ernie Lopez. Senator Lopez has shown an ability to campaign hard and honestly, he has more over shown the ability to remain connected to his community and district, these along with him being a genuinely nice guy, guarantees that he will go far in politics if he so chooses. The under the radar award goes to Mark Blake who in his run for New Castle County Executive received more votes in New Castle County than did even Mitt Romney. Rookie of the year goes to Senator Brian Pettyjohn. The Senator may have backed into an election, but has proven to be one of the most consistent conservative votes in the Republican caucus. Most conservative Democrat goes to Rep. Trey Paradee. I know Trey Paradee personally, and I know why he is a Democrat, however, except for a few rare exceptions, Rep. Paradee has voted an astoundingly conservative record, which goes to show, it’s not always the party that defines the person. Biggest Republican goes to Chris Christie. According to reports though, this will be the last year he will win this award. The Hispanic outreach award should have gone to GOP State Committee Vice Chair Nelly Jordan, since this was one of her campaign planks, however I have seen little evidence of anything she may have done to reach out to the Hispanic community. Therefore I will award the Hispanic outreach award to Ernie Lopez. Not for any one thing he has done specifically. But simply for being an example of what any person can achieve if they work hard enough, regardless of their ethnicity. The year’s funniest home videos award, goes to Lacey Lafferty, who after announcing her intention to run for governor of Delaware in 2016, launched into a video campaign, creating some of the funniest videos I have ever seen. Thanks for the laughs Lacey, that is unless you were serious. The Good Deed Of The Year Award goes to Judi Mangini. Judy has, for quite some time now, been running what she calls Operation Cookie Drop Off. It started with her and some friends baking cookies and sending them to troops overseas. It has grown into a yearly event that collects cookies from around the state. Judy does many other things that would earn her this award, however this one is just too special to ignore. Thank you Judy. The hardest working man award goes to Judy’s husband Paul. Paul collects boxes for shipping the cookies. He helps collect, count, pack, and ship the cookies. One might say Judy couldn’t do it without Paul, but I bet she could. There was a tie for the, I didn’t see that one coming award, the award goes to both Sussex County Sheriff Jeff Christopher, for not seeing the inevitability of his court case loss. And to Governor Markell for not seeing that Fisker Automotive was a rat hole for tax payer dollars. The NSA lifetime achievement award goes to another of our frequent guest here at Delaware Right, William Christy, for tracking IP addresses and documenting sock puppet identities and gathering meta-data better than the NSA. 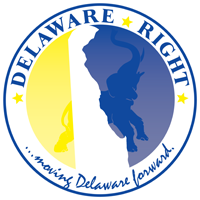 The what the hell award goes to the entire Delaware Democrat Party for the last Legislative Session in which they ran more social issues bills and gun bills than they did any bills concerning jobs, the economy, energy or anything having to do with the fiscal responsibility of the government. And finally the award for the person who did the most to move the GOP forward, who did the most to encourage new people to join the GOP, and maybe some who left the GOP to return, the person who did more for the GOP in one decision than many have been able to do in years of volunteering and working on campaigns. This award goes to Don Ayotte for leaving the GOP. Thank you Don, you can’t know how much this was appreciated, and by how many. Not Don Ayotte in 2014! Or Ever. Attention, Attention, this just in, a late breaking alert. It seems that an article was posted at another blog site on December 20th, 2013 which wins its author the Pinocchio award. It seems as though Don Ayotte is a two-time winner this year. http://www.delawarepolitics.net/hexavalent-chromium-found-at-closed-vlasic-pickle-plant-and-possum-point-groundwater/#comments Be sure to read through the comments to find out how Mr. Ayotte won this award. 29 Comments on "The Best And The Worst Of 2013"
I would add the blog wars of 2013, when a moderator or someone poseing as a moderator from DP, drug the mud accrossed 3 blogsites that I know of to the chagrin of the regular players at those sites. Once again we agree with waterpirate! Missed you too WP!! We (I’m ‘Fred’ and the one writing this comment on behalf of those actually here) post in the third person because it’s not really a one person comment. Many things we comment on are discussed around the house and at the dinner table that ‘Wilma’ provides every evening. One person (usually it’s either me or Wilma but almost always the comments ‘we’ make here are a combination of thoughts of the people that inhabit the House of Tuxamus Maximus of the day, or days, before an actual comment is made here. Mr. Knotts playground is still the only place we are allowed to comment on. At all times the House of Tuxamus Maximus is inhabited by no less than both Fred and Wilma Flinstone. We may come and go but we always sleep in this home every night and it’s been great to have this roof over our heads thanks to TMV. Most of the time we have others here as well. IT ‘kids’ (one couple more than the others that come and go from DC area) and some that study for special exam but can offer immediate advice, or insight into matters they have all gone to school for many years with specific ‘specialties’. Yeah…kind of vague but that’s also one reason why we do this in the third person. The House of Tuxamus Maximus exists for many reasons but the main one is that it will be a ‘safe’ house when the time is required. In the past some have stated they don’t like that we post in the third person and for them we can only offer that we will try to identify by an initial the actual person that sits at the keyboard. Otherwise you’ll just have to deal with it because “that’s the way it is” (all hail Walter Cronkite!). ‘Fred’ and ‘Wilma’ are Sussex lifers. We have been homeless. We have known TMV almost 40, if not 40, years and we would get in front of a bullet for him for what he has made possible for us. The others are all much much younger. We are about as independent as they come (but not pod people by any means YEECH) in our political thinking. We are commenting via remote access to an old Micron computer that has a Pentium 100 chip that is operating on a computer network far far away. This is done for Mr. Knotts benefit in as far as knowing a certain IP address is monitoring all that happens here. TMV holds Mr. Knotts in very high regard and no matter how we may feel about his thinking we must always do our best to maintain that level of respect. It is a “Prime Directive” for us even though he doesn’t understand the value of the needs of the many outweigh the needs of the one or few. Thank you Mr. Knotts for the award bestowed upon us even though we have been on an extended hiatus. We got a spanking but we are back now. Call us a ‘collective’ if you wish but we are back. Mr. Knotts or anyone else can call us whatever you, or they, may wish but we are the people that inhabit the House Of Tuxamus Maximus somethere between Bridgeville and Ellendale. V might come back once only to write of his ‘Obamacare’ experience now that things are settling in a bit regarding his experiences of late concerning healthcare but when and to what post Mr. Knotts provides we don’t know. The worst part of our ‘spanking’ was not being allowed to comment to Pandora when she visited here briefly. We read you Pandora. Best wishes in the new year to almost all and we truly regret that we weren’t able to wish almost all a Merry Christmas until now. Since it is Friday we do want to get back to wishing almost all a great weekend (make the best out of the miserable weather!) once again. We are back! We’ve even provided Mr. Knotts with an email address that gets checked occasionally…by us!! All third person of US…The House of Tuxamus Maximus!! The real TM had a procedure today and is doing very well we hear. V and his wife are happy! Hmmm… not sure what you’re talking about, TM. You could email me at pandora@delawareliberal.net, but I understand your desire for anonymity. You should stop by and comment more frequently. IMHO a more diverse and inteligent discourse is what we are all about over here. House Tuxamus Maximus seconds waterpirate’s motion! Hey, I’m still here too! 2. TUXMUX, all of y coz you guys make me LAUGH, LAFF, get it now? 3 Frank, should get an award for putting up with all the drama and staying the course. Happy new year everyone! Hope it is happy and prosperous! I am not in Steve Smycks district But I am familiar with his works. I believe he fits the demographic of that district, and is a Republican. Whats not to like? People will soon come to realise that D.A. seems to run for the sake of running. I can not wait to read his platform/ or should I say manifesto? To all thank you. Pandora, please excuse my omission of you. I can award you a follow up award for being the most open minded wacko liberal! LOL ! I agree with WP, I wish you and others would please come and join the conversation. Of course we will not always agree, but in the past, both here and at DL and that other so called conservative site, when we have disagreed, we have always been able to do so without resorting to insulting each others intelligence. I and the others here at Delaware Right truly seek input from all sides so as to move Delaware Forward and not simply to the right. The truly good ideas that benefit the most citizens will not necessarily come from either just the right or just the left, but most likely will be a compromise of the two. As for Don Ayottes run in the 20th? Well since he was caught red handed lying about people he met and spoke to at meetings about the Millsboro chicken plant, and admitted to it on “HIS” blog, I would say he is toast over done. But of course he and the other POD people will not have the common sense to know that and will simply claim that he is being attacked because he is the only champion against corruption. I think that is true. He seems to be focused on elective office of any type. Since it is not clear how he makes his living, I wonder if part of it is not the desire/need for a paycheck? Since I am talking about blogs, I have to provide kudos to DL, who continues to be timely and relevant when it comes to DE political matters, candidates and elected officials. Perhaps DR will grow to be as relevant. Thanks to Dave the movie Clockwork Orange will be the Monday night movie here at the House of Tuxamus Maximus! The ‘kids’ have never seen it and they need to see and understand that movie. We also agree with Dave’s comments. It’s so nice to be back and know that in time we can play with Laffter once again. You provide so many giggles around here even when all we could do was read them. We never stopped toasting you at the dinner table. Sometimes we tend to get a bit loopy with all the toasts. The House of Tuxamus Maximus would also like to second the award Laffter wishes to bestow Mr. Knotts. His efforts have at times been rather heroic. Why he had to mention the name for the NSA award mystifies us as that’s usually all it takes to ruin things. The rookie of the year award is also an outstanding selection all things considered. Stay warm all. Just bundle up and ‘laff’ at the cold. The award for Ayotte is well deserved. The House of Tuxamus Maximus wants to thank Dave for recommending (well yeah you did!) A Clockwork Orange for the Monday Night Movie of the night! The TM’s loved it although we did have to rewind a few times to understand what Malcolm was saying, or trying to say. The movie was preceded by our own little awards banquet featuring a wonderful Pot Roast meal prepared by Wilma. Much was left over but most gone by lunch today. Many that comment here on DR were toasted! Too many to list really but you all know who you are. A few were roasted and some were skewered separately, and repeatedly, but we used Mr. Knotts post as a base line adding a few (we won’t be going there) along the way. A thank you to Mr. Knotts for providing the lively fodder for the evenings dining conversation. We all wished that the Queen Bee Pandora could have been at the head of the table and Mr. Knotts at the other end to honor his efforts and diligence. Amended that to acknowledge there actually were two empty chairs provided for both and that Laffter and Waterpirate were in the corner finally getting a chance to drink fine lagers together paying no attention to any of us. A rather large bet was laid out that Pandora could explain to Mr. Knotts the meaning of Spock’s words: “the needs of the many outweigh the needs of the one, or few”. We may never know but we are trying!! As a side to Laffter: you were quoted many times as the many posting and comments were scrolling on one of the larger monitors that was brought into the dining area. You are a priceless jewel of giggles to this site ever since we started coming to Mr. Knotts playground way back when…before we got spanked and put on hiatus. What is nice is I can really disagree with Frank , which I do, often and openly….and WP ( except about stouts) and Dave is always the best as the adult in the room, I admire his flair, and Pandora is breat when she pops in….. But TM, YOU guys/gals are the bomb, the whole third person thing and the vocal objections written by some posters were priceless! Yup, sharp tongue, a vicious weapon never to be underestimated. Ok Laffter it started about 7:50 this morning when TMF put your comment on the kitchen monitor. Sleepy heads awaken and stumble in and once the first “we da BOMB Ka BOOM!” was yelled out it’s gone from funny to annoying because it’s become a chorus now. One starts and the others chime in and finish…but F and and I still get a giggle out of the 20 somethings enjoying your comment about House TM. Keep the ‘weapon’ loaded and firing from the fingertips! We all want you to stay & play and try to get Harry W back on the swing set while we try to get our Pandora fix. TMVolunteer texted he’s trying to come up with a comment for the current healthcare post of Mr. Knotts so stay tuned. I listen to Bill Colley’s show today and it appears you are a Closet Kluxer. But then, What’s new? That is rich coming from someone who supported Glen Urquhart! We wonder if there could be an award offered for the commenter with the most varied and weirdest names by a single ‘person’. We would gladly go back to being simply Tuxamus Maximus to avoid confusion and easier third person comments. That would allow the angry bergers and ichy bads to move up the totem pole. Can one dance around a totem pole? I wonder Ftrank why you decided to make this an attack site. I know you attack people like Colley and Ayotte to generate comments because you write like crap. You can’t hold a candle to either one of those men, there boy. You only get many comments on your attack posts. Who are you going to pick on next on this piece of s**t blogsite. A couple of weeks ago it was Colley and now it’s Ayotte. They are two of the people actually lay out the truth and the people of Possm Point are grateful for Doug Beatty, Ayotte and Colley. They stand for the people. If you could write about issues instead of hanging onto Ayotte’s coattails, and learn to write, then you would have the right to critisize him and others. You are followed by a pack of hyenas with no life at all. You aren’t even the head hyena but every so often to keep their loyaly you throw them a fresh carcas. You’re pitiful. John, thats all the man can do! What he has been blogging for how long? Decade! And this is as far as he has got, another blog site! All he knows is to attack anyone and everyone regardless whether he truly knows that person at all. What I find comical is that attackers like Knott’s and no class Christy truly have no friends BC they alianated everyone around them with their lies, no facts, bad behavior and atrocious foul tongue then they deliver dialogue how bible thumping Christian they are! Oh, just priceless. I am sure the day will come when something happens in their lives to where they will need someone and guess what, that someone will not be there but the gutter rats like Laffter aka Anioni, MT, WP, Panderosa and the other despicable liberals who frequently slither from under their DL rock. But maybe next time you should have your gun grips done in Mother of pearl…. It would be the only level of class and you would have to buy it. Laffter just take for granted we do happy dances here every time a ‘Mike’ or his like comments because they just don’t understand how stoooooopid they look and you just can’t teach that kind of stooooopid. Opps…did we sink to their level? Hope not. What is your implication here? That Mike isn’t white? Or maybe with your vile “Totem Pole” reference, that he is of Native American ancestry? What does his- or anyone else’s- ethnicity have to do with anything? Yes, you “liberals” sure are “tolerant.” Just like Hitler. Thanks for showing us your true colors. DR should be proud to have you as a regular. What is you’re implication here? That someone isn’t “white?” Or, with your vile “Totem Pole” reference, that someone is of Native American ancestry? What does someone’s ethnicity have to do with anything? Your nasty post is an extant example of the liberal’s idea of “tolerance.” Similar to Hitler. Maybe you should engage your brain before posting racial insults, irreverent or otherwise. I apologize for the double-post. Unintentional. Sorry about the double-post. Unintentional. And as dancing around the maypole was an rather ancient European tradition…. And Native peoples never danced around a Totem Pole….what is your point exactly? You have absolutely no idea what you are wading into, but true to your type, you think you do and just make yourself look the fool……but then again…. Like the name calling BTW, but it’s typical for your particular ilk. Your comments were vile and racist. A pathetic display. Instead of pathological denials, you need to apologize.